There is no metal quite like gold as history shows that humans have a special attraction towards gold as this metal like a parasite has held power over humanity far beyond any rational importance as a resource, even to the extent that hundreds of thousands have been put to death in its pursuit, even whole civilisations extinguished so that GOLD could adorn the GOD temples of Europe and elsewhere. Today's GOLD obsession manifests itself in the Gold bug army that relentlessly chants its second coming with never changing prophecies of Gold's eventual rise to new highs. And as it was for 2013, so were the expectations for 2014 for the price of Gold to soar into the stratosphere bitcoin spike style with the 2011 high of $1901 merely acting as a stepping stone all the way to $5,000, then $10,000 and beyond. So what happened to Gold during 2014 ? Well the gold price graph illustrates diddly squat - Gold started the year at $1204 and looks set to end the year little changed at around $1180, no amount of near religious chanting during the year could sustain the gold price beyond its early year peak at $1392, following which the path was ALL down hill as the Gold Bug army wasted another year fighting a losing battle on hopes of a financial / economic collapse that would result in the long awaited for flight into the safety of the golden metal just as their opposite numbers in the stock market, the perma bears were left in the wilderness for the SIXTH year as a series of imminent stock crashes and bear markets ALL failed to materialise. The problem that analysts face and not just gold analysts is that when one glances at gold bug commentary one can clearly see that they have long since fallen in love with the 'precious' metal and as everyone knows love tends to be blinding which is why perception is so easily skewed of what gold actually is that fails to reflect reality of that which could be probable. However, virtually anyone can be seduced by gold, the only defense against which is to NOT look at gold in terms of analysis of the gold price for some time. This is an important analytical tool for ALL markets as the worst thing an analyst can do is to become obsessed by a market, to stare endlessly at price charts day after day, week after week, month after month because what comes out will not be that which is most probable but that which is skewed through what one wants for the love of Gold. Therefore as I approach this analysis of the Gold price for 2015, I do so having avoided conducting an analysis of gold for over 1 year, free of any preconceptions of what gold should do, a blank slate upon which the probable trend for 2015 should emerge. To find out why man is obsessed with gold we have to look back in time, back before the first flat earth societies were able to write down their creation myths onto scrolls kept in gold jars of how the obviously flat earth was at the centre of the universe with the likes of the sun and moon as being mere similar sized lanterns that traverse the sky each day and night, all without the concept of the earth orbiting a star within a galaxy of 200 billion stars let alone that there were probably more than a trillion of galaxies beyond our own, something we only realised quite recently (1923 - Edwin Hubble)! Religious scripts meant for all men to slavishly follow like domesticated animals in preparations for the always imminent end of Time, Armageddon, Judgement Day when the dead were said to rise up once more. Further back before the early empires first used the soft Golden metal to fashion into trinkets and coins as means of exchange, back before the civilisations started encasing their temple palaces in Gold leaf much further back in time, many more thousands of years, back before humans started to settle down and farm the land that marked the birth of civilisation, further back for mans obsession with Gold predates even the waves of human migration out of Africa starting approx 100,000 years ago, of which one eventually proved successful approx 60,000 years ago which approximately now marks the divergence between African humans and All humans outside of Africa who generically are equally distant in time to african humans. However, where Gold is concerned we need to go back further to where what one would recognise as being modern man branched off from our ancestor Homo Heidelbergensis, itself emerged some 400,000 years earlier from Homo Erectus that had already existed for a million years and colonised much of the planet when our species was a mere Island on the planes of the african savannah, and which went on to seed many more human species other than our own such as Homo Neandetheral and many more across asia. Homo Sapiens emerged approx 200,000 years ago on the rift valley of africa but to understand gold's hold over man we need to go still many times further back in time, in fact many millions of years for our species is just the most recent branch of a family tree of proto-humans that stretches back for at least a further 6 million years that only started to evolve into humans when the rift valleys trees gave way to the savannah grass lands of approx 3 million years ago which marks the point where we will find the answer to why Gold is so enticing for humans for it has been imprinted and reinforced through natural selection into the DNA of every cell of our bodies! This proto-human of 3 million years ago that in appearance would be recognised as being little different to modern chimpanzees than anything that resembles humans, only really differed in one ability from chimpanzees and that when it jumped down from the trees it would walk upright on 2 legs to the next island of woodland, and if pushed / presented with danger whilst being no marathon runner nevertheless would be able to run to escape predators between fast dispersing woodlands as they gave way to savannah and that marks the starting point for mans obsession with Gold as mans hands would increasingly become free to handle objects including those eventually fashioned from the golden metal. And it is here where man's obsession with gold begins, not because there was an abundance of gold on the african savannah but because what was really precious on this parched landscape was WATER! The distant pools of water shimmering on the horizon that sparkled gold and silver in the sun light and so those hominids that were best able to see / locate water were able to survive and passed on their genes to subsequent generations, reinforcing over time mans obsession with all that shimmers gold and silver to this very day as being PRECIOUS. Given the time span of our vaguely recorded history of at most a couple of thousand years, the 6 million years since we branched off from other primates is an unimaginably long period of time for Gold to have imprinted itself to an extent it is impossible for any human to avoid its apparent magical pull, for we will always see life giving value in the 'precious' metal. Look around you, and you will find many examples of Gold's influence in the very room you sit in, and very probably on your very body! 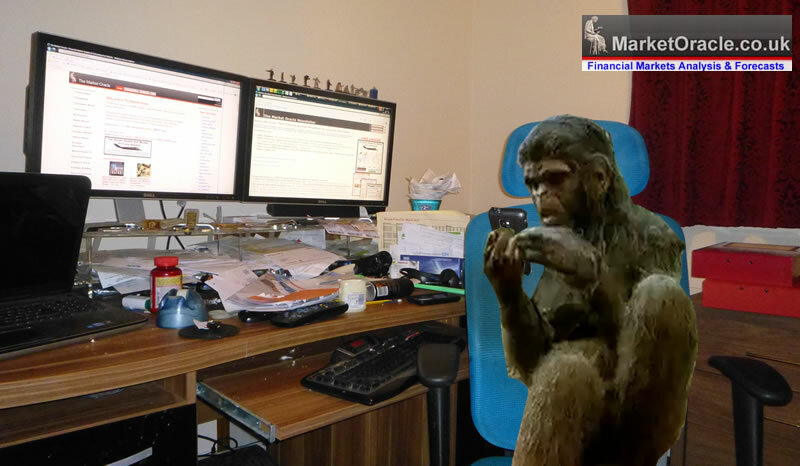 Apes can only perceive the world in terms of Apes evolved sensory input and mechanisms for interpretation (brain) i.e. in terms of banana's. Which is why whilst today the human primate perceives itself as being highly advanced and in large part detached from other animals. However as the Christmas holidays reminds us that still over 90% of humans are only one step away from slavishly bowing towards the Holy Banana in the sky whom we hope to join in a banana filled paradise after life for all eternity. Which remains the greatest risk to humanities survival as at the end of the day all religions are DEATH CULTS that crave the END of this world so that they can be resurrected rather than representing the best of humanity they tend to represent the worst that man can do to one another all in the pursuit of their respective holy banana's supremacy. Back to point, I will now utilise the evolutionary advantage of our long path of which only a few percent of today's living humans still actively employ the use of as unfortunately most humans over the past 10,000 years have become conditioned to behave little different than domesticated animals where someone tells them what to think and what to do, even in which direction they should bow their heads in prayer, or nod towards brick walls or hold anti-vampire symbols in high regard and much worse instances of manifesting what amounts to zombiesk behaviour that is devoid of utilisation of ones frontal lobes that had been in the works for literally millions of years that ultimately meant our survival and the extinction of all other hominids which is our ability to imagine the future that is the reason for our civilisation to have progressed to such an extent that TIME, the FUTURE impacts on virtually every aspect of our lives as those few percent of people we actively imagine where we will be not just next year, but thousands even million of years into the future and by doing so then make those futures become manifest as we start to imagine glimpses of the uncertainty of reality of what we are made of particles and waves, heads and tails, past and future, as long as we can resist the holy banana cults. Gold and Silver bugs hopes of Sound Money return to the likes of the gold standard trouncing fiat money has once more failed to materialise for another year for the primary reason that it is just never going to happen, or rather not under any western style democracy, for this I don't need to indulge myself in in-depth analysis but direct readers attention to what continues to take place in the Euro-zone where the PIIGS adopted pseudo sound money of the Euro have found themselves in the precise predicament of where they would be had they had a Gold standard, namely that they have been unable to just print debt and money to buy votes with the stealth default consequences of inflation, whilst on the other hand we have the examples of the United States and UK that can and do print debt and money in ever expanding volume as they seek to buy up their own bonds (via central banks buying from bankrupt banks who borrow form the central banks to do so) and thus subvert the official debt to GDP ratios as I have discussed countless times over the years as illustrated by Bank of England Cancels Britain's Debt (Dec 2012) with the below graphic illustrating the money and debt printing / cancellation highly inflationary game that Britain has been playing for the past 6 years. The euro-zone looks set to literally enter 2015 with a BANG as the Greece Crisis looks like coming back with a vengeance with the probable election of a Marxist hyper money printing debt defaulting Syriza government that through its actions will put the euro-zone under huge strain with cracks soon appearing in other PIIGS nations such as Spain and Italy, thus sparking a flight to safety which includes to GOLD. So, if you have read a few of my articles over the past 6 years you will know that the only answer that the governments of the world have had is to print money and debt to inflate real terms liabilities away. Sound money or even pseudo sound money prevents governments from doing so and therefore ensures a deflationary depression. Instead we are immersed in an inflationary depression that steals purchasing powers of workers earnings for governments to then bribe the voters with, which given the real world comparisons appears to be infinitely more palatable to the masses than deflation and therefore explains why every government and their central banks engage on theft of purchasing power. So Gold bugs looking for sound money to turn Gold into Currency will probably find that their descendants still be waiting a for such an outcome. Ironically, if Gold never does become money (in our life-times anyway) it is still good news for if it were so then it would probably mean that Gold's future prospects would not be as good as they are under our fiat currency money / debt printing exponential inflation inducing monetary system as governments would seek to dictate what the price of gold should be rather than the current system of manipulation of all markets. Now, whilst it has been been a long time since I last analysed Gold and Silver. However, if you have been reading my articles you will be aware of the prevailing exponential inflation mega-trend as a consequence of government debt and money printing that continues to exert upwards pressure on asset prices and even more so when leverage is taken into account, so given that the gold price has gone nowhere for the past 3 years then then perhaps three years of inflationary pressures could spark a gold bull run for 2015? Gold Secular Bull Market - From 1980 to 1999 the Gold price fell for 20 years, eventually it would bottom and embark on a 10 year bull market, the signs for this would be not in fundamental data, but contained within the price chart as Gold price breaks the pattern of corrective rallies followed by the downtrend resuming to new bear market lows. Some 10 years later (into mid 2011) Gold corrected the preceding secular bear market by 50% in time and well over 100% in price. The subsequent trend has seen what resembles a series of multi-year corrections of that preceding bull run. Central Banks Buying Gold - For many years central banks were net sellers of gold but over the past 3 years have been buying at the rate of about 10% of annual new supply. Though don't expect central bank buying to create a price spike as they would seek to avoid such an outcome by buying the dips. Therefore in terms of Gold price action, we can expect the central banks to have effectively put a floor under the Gold price which the price charts implies is around $1130. ZIRP - We have been in a Zero interest rate world for over 5 years now with NO signs that this is going to change during 2015 as a consequence of the still growing huge debt mountains, that is unless the markets through a series of panic events force the central banks to raise rates. ZIRP should be a strong positive for Gold due to negative real interest rates and therefore indicates continuing upwards pressure on the Gold price. The above graph clearly illustrates that even on the official CPI inflation measure (which tends to under report real inflation), that the US is no different to any other country which contrary to the perma delusional deflation propaganda is instead immersed in what has always been an exponential inflation mega-trend which vested interests and only deflation fools have been blindly regurgitating the threats of ever since the Great Recession of the 2008-2009, which the above graph clearly illustrates amounted to nothing more than a mere blip or as I warned at the time of a deflationary ripple on the surface of an ocean of Inflation. The Inflation Mega-trend Ebook of Jan 2010 (FREE DOWNLOAD), re-iterated that asset prices tend to be LEVERAGED to Inflation and oscillate around the Inflation Mega-trend, which is precisely the trends that have subsequently transpired from stocks to commodities such as Gold and as I have been flagging since 2012, the housing markets that culminated in the three year US house price trend forecast as of January 2013 and the 5 year trend forecast for UK house prices as of the start of 2014. However, even when taking into account Gold being leveraged to the Inflation Mega-trend, The Gold rising by more than 7 fold to the last bull market peak is well beyond the rise in CPI of 35% over the same period of time, so was much more a sign of a great deal of speculative interest than being driven by inflation fundamentals. And another point for the Gold bugs to consider is that in the late 1970's inflation was running at more than 10% per annum! So whilst gold did not experience a bubble spike, however it's relentless 10 year trend higher had accumulated much speculative interest that the subsequent 3+ year bear market has been seeking to unwind, which still remains many times that which pure inflation indexation would have delivered over the same time period even after allowing for leverage, so one cannot look to the ongoing inflation mega-trend to generate additional over leveraged gains, instead what one needs to determine is whether the Gold market is ready for SENTIMENT to drive a reversal in the gold price higher else the Gold price could still continue to dissipate speculative interest accumulated during the preceding 10 year bull market and therefore a continuation of the bear market to NEW lows. Crude oil is clearly in a STRONG downtrend / bear market with no sign of an end to this that ultimately targets previous multi-year lows along $36. Which implies that the over-riding trend should be towards lower oil prices before the crude oil price bottoms out. This therefore continues to suggest US Dollar strength for some time until such a basing pattern starts to materialise which conveniently coincides with my building view for the US Dollar strength into a mid 2015 peak. The implications are that a strong dollar suggests a continuing weak crude oil price implies similar for Gold for much of 2015. The following chart illustrates the inverse relationship between Gold and USD trends i.e. most of the time Gold and USD move against once another. However it is not black and white as there are times that Gold and the USD exhibit synchronicity to varying degree which should not be so surprising as both are classed as safe havens in terms of financial, economic and geopolitical uncertainty of which we have much of going into 2015. The most recent price action is exhibiting synchronicity over an inverse relationship i.e. whilst the Dollar has soared, Gold has in fact held steady. Which is bullish as it implies that Gold could rally during 2015 despite further dollar strength, yes it would be tough and the quality of the rally could be weak but this chart suggests Gold could rally. Therefore the US Dollar implies that the current depressed Gold price could find support and hold its own whilst the dollar rallies during 2015, at least until the US dollar is expected to peak late Summer 2015, perhaps afterwards the Gold price will be able to muster a trend breakout of sorts and put on a sizeable price gain. Off course a strong dollar means that the USD is rising against other currencies which automatically translates into relative gold price strength when priced in other currencies as illustrated by the below chart for Gold priced in sterling. The key point here is in a marginally stronger gold price chart that has failed to break end 2013 support. Which gives added support to the Gold price during 2015 that translates into suggesting a milder downtrend against the USD. 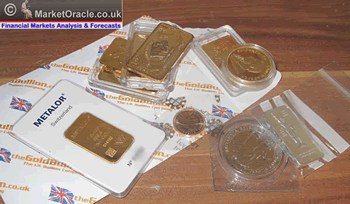 24 Dec 2012 - Gold Price Forecast 2013, Buying Opportunity?, is Silver Cheaper? The annual % change graph further illustrates that whilst Gold has not experienced a short-term price spike along the lines of that of 1979, however one can see that it has experienced several spikes that were spread out over a number of years i.e. into 2003, 2007 and 2010. With the intra-2011 spike not registering as Gold experienced a sharp sell off into the end of that year. What does this suggest for Gold going forward ? That the best gains for the gold bull market are probably behind us, i.e. that Gold despite intra-year spikes is unlikely to experience annual gains of much more than about 10% per year with the probable range of between +4% and +10% per annum, which is the year end range one can expect for Gold for 2013, or a target price of between $1726 and $1826, which is not exactly what many gold bugs will be dreaming of i.e. a 1970's style spike for which I do not see any signs of materialising at least for several years, let alone for Gold to actually hold a break to new all time highs thus probability favours the bull market continuing at a far more subdued rate. So another warning not to get carried away by the uttering's from a long list of Gold bugs who keep banging the drums for a bubble spike that may never materialise (over the next 5 years). For the current analysis I want to gauge the probability of what FOLLOWS a bear market in Gold i.e. the Gold price fell by near 30% in 2013 and has gone nowhere during 2014. So what does this annual pattern imply for 2015 ? Well the good news is that Gold ending down on the year is improbable. The bad news is that neither does Gold look set to soar into the stratosphere, the best that the Gold price could muster during 2015 would be about a 10% gain and that's the best, therefore most probable is another year of stagnation i.e. we may see Gold end the year up between 5% and 10% so between $1250 and $1320. GOLD STOCKS - Another point to consider is that the lower the Gold price falls, the less profits gold miners make which means less investment in new production and thus the longer the duration gold price slides the more likely is that the Gold price will be setting itself up for a strong bull run as it takes time to bring new mines on stream in reaction to bull runs. Therefore Gold's stagnation for 3 years which includes a 2 year bear market should be sowing the seeds for a strong future bull run. Another point is at what Gold price will a number of Miners start to make losses which means they will start to moth ball mines or even go bust, as it does not take much change in demand to result in huge changes in price i.e. as little as 5% reduction in supply can ignite bull runs of 50%! On searching the net I am finding a wide range of statistics from $950 to $1150, which at least implies that the Gold price downside is limited to this range and increasingly so which means any slide below $1150 will NOT be violent but shallow no matter how strong the USD trends into Mid year. ELLIOTT WAVE THEORY - August 2011 marked a fifth wave peak, and thus the subsequent trend over the past 3.5 years is corrective that should resemble an ABC correction. Therefore what I need to determine is there is any discernable ABC pattern which could signal a bear market bottom. What stands out from my EWT interpretation of the Gold Price chart that it is not surprising why so many have called gold wrong, for clearly if one just relied on EWT then they would have convinced themselves that the Gold price surely MUST have bottomed in June 2013, since which time most EWTers would have concluded that the Gold bull market had resumed despite failing to hold the June 2013 Low in January 2014 and then again more recently in October and November 2014. Clearly gold cannot be in a bull market if it is making NEW LOWS! Therefore where gold is concerned EWT is a RED HERRING, there is no point in repeatedly attempting to fit complex fantasy EWT patterns when it clearly is not working. Which means I am going to ignore the ABCDE pattern that implies gold has made a low because it will probably be busted just as Gold has busted its June 2013 low several times since. TREND ANALYSIS - The down trendline along 2014 implies that the Gold bull market would resume on break of $1280, that by end of 2015 would have fallen to $1160. So basically if Gold ends 2015 where it starts than that would be a trigger for the resumption of the bull market. The immediate wedge pattern is likely to result in gold breaking to the downside. Gold is also exhibiting reducing volatility which means that Gold should experience an increasingly quiet year that implies any breakout later in the year will catch many by surprise who had long since given up on the dull going nowhere trend. SUPPORT / RESISTANCE - Gold has heavy support underneath all the way from $1130 to $1180, and again a series of resistance levels from $1240 to $1400, which again implies a quiet year for gold. So even if Gold does hold onto the support levels it may not be able to break beyond the $1400 barrier that could mark the spike high price for Gold. However a break of support implies that the preceding resistance levels rather than containing gold could instead act to propel the gold price sharply higher as a series of short stops are run at these levels. PRICE TARGETS - The immediate bear market target is the low of $1130, then $1050. Whilst to the upside, $1250, then $1350 and then $1400. Bear Market seasonal tendency is for the Gold price to peak late Feb to Mid March then decline into August and then to rally or hold steady into year end. Bull market seasonal tendency is for the Gold price to have 2 bull runs, Jan to May and then July to November. Overall tendency is weakness into August and then a rally into November. Seasonal tendency in terms of unfolding analysis implies Gold rally into late Feb, decline into August and then rally into Mid November. Over the course of this analysis early assumptions that a 3 year bear market could have dissipated much speculative gold bug fever and thus primed Gold for a decent bull run during 2015. However as this analysis has unfolded, the probability wave has coalesced around the point that rather than showing signs of building strength instead Gold is manifesting weakness to the extent that I am finding myself pulled towards determining how LOW will the Gold price go during 2015 before turning around during the second half of the year. Furthermore, it is likely further analysis will have pushed me even further down this route. Clearly the last low of $1130 is most significant which is where the Gold price will likely target a break of during 2015 and given that it is just $50 dollars away than it is likely to BREAK. So what comes after $1130 ? Well that would be $1050 and then not too distant is $1000. Which suggests that the Gold price is targeting a trend to between approx $1000 to $1100 during 2015 and probably settling towards $1050. In terms of trend I can utilise the USD inverse trend forecast and seasonal's as a rough road map which suggests gold weakness into Late summer, and then a rally into end of November which IF Gold marks a bear market bottom then that rally could be quite substantial, i.e. not of that which we have seen the likes since the last bull market, i.e. recoup ALL of the downtrend of 2015 and then some, perhaps putting on twice the dollar gain as was lost earlier in the year, so a $1050 low would translate into approx $1320. I will take a separate look at the prospects for silver, so ensure you are subscribed to my always free newsletter to get ongoing analysis and detailed trend forecasts in your email in box.